UpdataCoding - create custom indictors, trading strategies and visualizations Updata has a built in easy programming language with dozens of pre-written analysis commands. This allows users with little knowledge of programming to script their own indicators and trading strategies for optimisation or back testing. More advanced programming can be done in Visual Basic and C# within Updata as well. 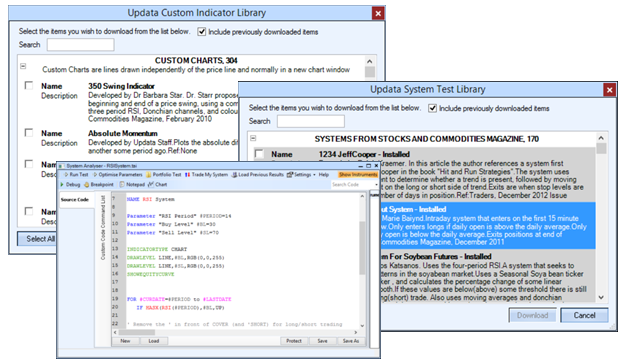 The Updata libraries come with over 1,000 pre-written custom indicators and trading strategies. The libraries are available online or in the case of firewalls are installed with each upgrade. We will even write indicators or strategies for clients meaning rapid deployment of new tools to the end user's system without installing software upgrades.